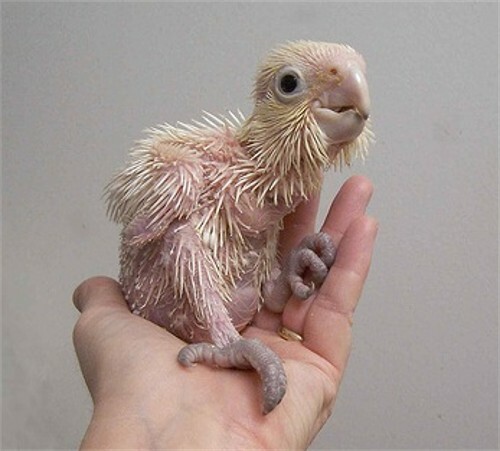 A cockatoo goes through several developmental stages during the course of its life, just like people do. From helpless baby it develops into a young adolescent and finally into an adult. In these stages he learns how to be social with other birds and humans, how to be independent and get a cockatoo-understanding how the world around him functions. The eggs of cockatoos hatch between 20 and 30 days after laying, depending on the species of cockatoo. When the hatchlings are born, they are completely bald and cannot open their eyes. They are completely dependent on the parents for food and warmth. After about one week the eyes of the young birds open. The feathers are also starting to develop, first as semi-rigid ‘spikes’ that will eventually break open to reveal the feather. This is because the feathers grow inside a hull. This initially flexible hull will dry out and become brittle, after which it will fall off the feather. In nature the young cockatoos leave the nest after 12 weeks for most species. After they leave the nest, they are still cared for by the parents; they will help it to obtain food and will help to keep a lookout for predators. When the young leaves his nest at twelve weeks of age, he still has to learn a lot about the world around him. What food can be eaten, what can better be avoided, where to find food, water, shelter and which other cockatoos live around me? They learn all this by staying in a flock of their own species and imitating the adults around them. In this way they quickly learn the ins and outs of living in this area of their habitat. Some cockatoos stay with their birth flock for their whole life, but others migrate to other flocks and continue to live there. A young cockatoo will engage in intensive social contacts with the other young cockatoos of his group. Within these other young birds he will find a mate. Until the age of 3 to 5 years (depending on species) he has not yet reached sexual maturity. However, he will already try to find a mate among the other cockatoos of its flock and will generally stay with this mate for the rest of his life. When cockatoos find a mate, it is generally a mate for life: divorce does not occur as far as we know, although sometimes a cockatoo will find another mate after the first one has died. The male and female of a pair can be easily identified as a couple; they will stay close together, will groom each other and will build a nest and raise their offspring together when they reach sexual maturity. A cockatoo can reach the respectful age of 80 to 90 years in captivity. In the wild this age is not reached due to predators and bad environmental effects like food shortage. Generally the life of a cockatoo does not change much after he has reached adulthood. All the things he needs to know has been learned when he was young. But this doesn’t mean he stops learning! 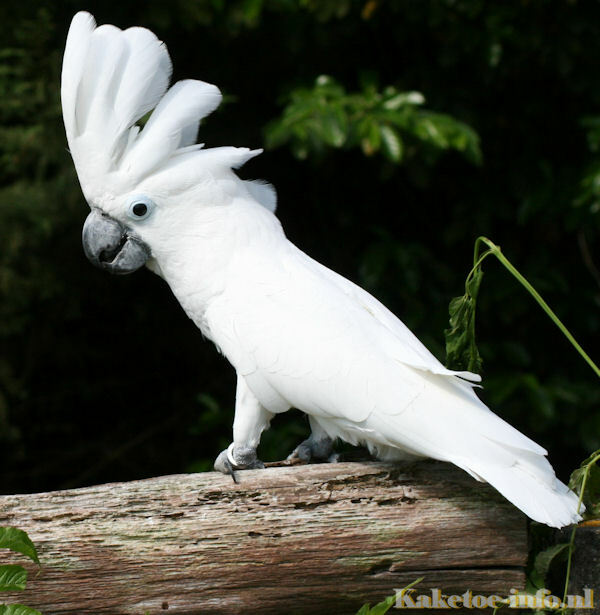 A cockatoo is capable of learning new tricks and skills until the end of his life. In the wild these are new ways to obtain food, learning to recognize the signs of novel predators and learning to mimic new sounds. In captivity this can be anything from doing a trick, micicking a sound or how to open the lock of the cage!